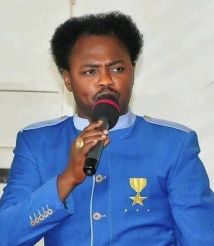 PORT HARCOURT – FLAMBOYANT man of God, Prophet Thankgod Abam has been reported assassinated in his Port Harcourt, Rivers state, residence. Abam was said to have been killed, Friday, by the suspected assassins, two days before the dedication of his baby in the Rivers capital city where he nurtured his Intercessory Prayer Ministry before moving on to Abuja amidst allegations of scams against some of his faithful. Nkiru Amaefula, one of Abam’s devotees in a tribute to the man of God said, “Oh Jesus, this is just too much. What a wicked world. Your child dedication is on Sunday 5th of August and now you are no more. Phone and text enquiries to Nnamdi Omoni, Police Public Relations Officer, Rivers State Command, for police confirmation of the incident attracted no response.